Please keep in mind that we are not vets and are not recommending any treatment. This is simply a re-telling of our experience with Bunny’s cataracts. Please see a rabbit savvy vet for a consultation if your own rabbit has developed a cataract and keep in mind that your experience may be different as time goes on and procedures change. Cataracts can develop at any time for no reason at all. They may be hereditary. Unfortunately, they can also be caused by E. Cuniculi, a parasite that many rabbits have been exposed to and that is often kept under control by the immune system only to take over as soon as the rabbit becomes sick, weak, or stressed. The test for EC is not particularly reliable, so even though Bunny tested negative for it, we still gave him Panacur for a few days to be sure. Bunny’s behavior didn’t change much at all. He still had one good eye and losing sight in the other one did not prevent him from jumping, exploring, or finding his treats. Even though we knew about a possible surgery, we decided against it at that point because every surgery has its risks and Bunny’s quality of life seemed the same despite him being blind in one eye. A few months passed before a second cataract began to develop in early May 2016. It only took about a week before Bunny was more or less blind in both eyes. He didn’t have much time to prepare and spent most of the day sitting in one spot, napping. He seemed angry, didn’t enjoy outdoor playtime anymore, and stopped exploring the house. He ran into things, got lost a couple of times, and heavily leaned on Bailey to show him the way. It took a good 3-4 weeks before he seemed to accept his blindness and became more confident around the house. We noticed that certain furniture and flooring helped him figure out where he was. The fleece blanket always had to stay on the floor, because it told him he was between the couch and his bench. The water bowl had to be placed in exactly the right spot, so it could lead him to the litter box. And whenever there was food, he would listen for Bailey’s chewing noises to find his share. Here’s a video we took a week before his surgery. He was extremely excited about the food, but simply couldn’t find it, despite my attempt to give him clues. In May 2016 Bunny was only 6 years old. That’s way too young to be permanently blind if you have a choice! Even though Bunny was adapting to the new situation and could have led a nice life even while blind, we decided to go for the surgery. Unfortunately, there are not many Ophthalmologists who will perform surgery on rabbits. 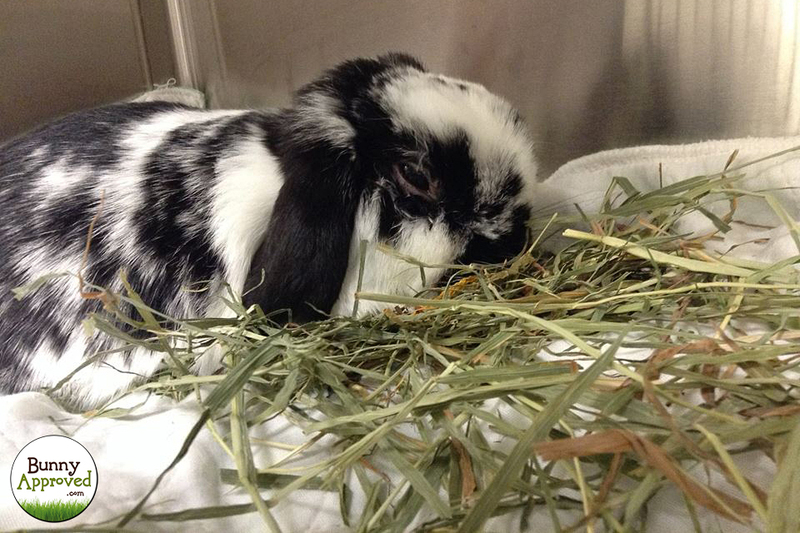 Our regular local vet contacted several animal hospitals in the area and none were willing to operate on Bunny. The closest one to us was nearly 3 hours away in Raleigh, NC. We didn’t know anything specific about the surgery and also didn’t know if Bunny would even qualify (for example, if the retinas are damaged, removing the cataracts will not restore vision), but we made an appointment for an exam on Tuesday, June 14th 2016. The surgery would be a day later and Bunny would have to stay until Thursday for observation. Ophthalmologists will need a referral from a regular vet, so even though you can find one online and contact them to see if they will treat rabbits, a regular vet will have to make the appointment for you after a general exam. That meant that following a successful cataract surgery, Bunny should be able to see again. Any surgery has its risks. Rabbits don’t always do well under anesthesia and there is the possibility of death, either during the surgery or due to stasis after. 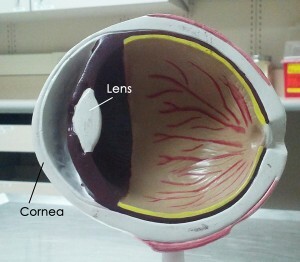 However, an eye surgery is not as invasive as a spay, for example. Also, Bunny was healthy overall. He was at a good weight and had no other health issues that could have put him at a greater risk. If he had been weakened by E. Cuniculi, for example, we may have decided against the surgery. Dr. Walters, the exotic vet, was present during the surgery to monitor Bunny and take action to keep him alive if necessary. She assured me that Dr. Westermeyer was very knowledgeable and had performed countless cataract surgeries on all kinds of animals, including rabbits. It made us feel good that someone was there who specializes in exotics to keep an eye on Bunny while an eye specialist worked on his cataracts. Dr. Walters also told me that due to the incision, the fluid between the cornea and the lens was drained, so they added new fluid towards the end of the surgery. Over time, Bunny will regenerate his own, but until then it could form visible bubbles, which is normal and no cause for concern. Once Bunny had woken up from the surgery, he was allowed to stay with Bailey in a cage at the hospital. He was sleepy and still had a catheter attached to his leg with some Vetrap bandages to make it easier in case he needed pain medication. I went to visit a few hours later and he was still very sleepy, but his eyes looked normal again and he could see me! Both bunnies were discharged on Thursday and we went back home. Bunny didn’t eat much that day and he seemed to be in a little bit of pain from the catheter, so I gave him some Metacam. He perked up a little and was back to normal the next day. He is now as active as he was before the cataracts developed and hasn’t had any problems seeing his environment. Diclofenac: Administer 1 drop in each eye every 6 hours (four times a day) until directed otherwise. Ciprofloxacin: Administer 1 drop in each eye every 6 hours (four times a day) until directed otherwise. Tropicamide: Administer 1 drop in each eye every 12 hours (twice a day) until directed otherwise. We were quoted between $1800 and $2200 for the surgery including all the exams and the hospital stay. We ended up paying $1656 for everything that happened during our 3 days in Raleigh. Hotel and gas not included. We have not gone back yet for the follow-up exams, but will update the post later. Bunny went to an ophthalmologist in Greensboro who graciously agreed to check his eyes one week after the surgery. That way we only had about 90min. to drive. The check-up took about 10 minutes and his incision looked perfect. He had zero inflammation and everything was healing well. 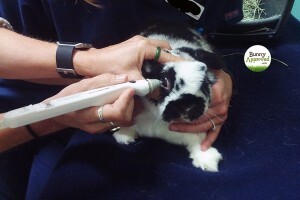 The doctor also performed a tonometry, which means she measured the eye pressure to make sure Bunny hadn’t developed a glaucoma. Luckily, he hadn’t! We were able to reduce the amount of eye drops to 2 different medications 3 times a day. At this point we needed a refill on the Diclofenac. The Greensboro vet didn’t have any in stock, so she gave us a prescription to be filled by any pharmacy. CVS charged us almost $75 for the exact same bottle we had at home. When I checked our hospital bill later, it said we only paid about $17 for the first bottle. Lesson learned! All future refills will be ordered from the hospital that did Bunny’s eye surgery! Another two weeks later we went for our second check-up. Bunny’s eyes were healing exactly the way they should! We were now down to 1 eye drop a day (our overpriced Diclofenac). Several check-ups followed with more and more time in between. It’s now 8 months post surgery and Bunny is doing well. He can see without any noticeable issues and has not developed a glaucoma or an infection. 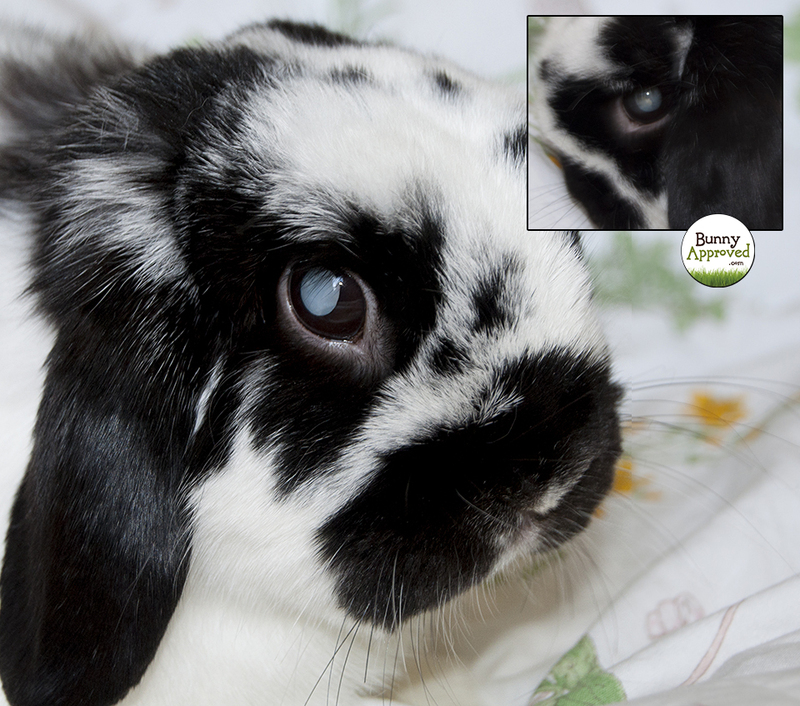 UPDATE 2: Around 9 months after the surgery Bunny’s eye pressure levels increased slightly. They are not above normal, but on the higher end of normal. 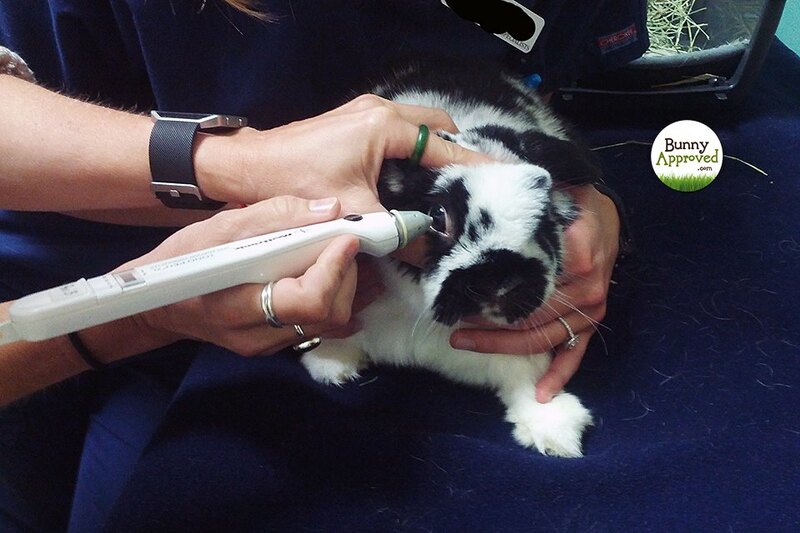 In order to prevent a glaucoma, Bunny was prescribed Dorzolamide 2% eye drops that he needs twice a day. The eye doctor said he may have to be on these long-term. They cost $31.92 when we purchased them from the vet and $85 at a local Rite Aid. Each bottle lasts about 6-7 weeks. UPDATE 3: About 18 months have passed since the surgery and Bunny’s eye pressure has gone back to normal. He still gets Dorzolamide 2% eye drops, but only once a day as a precaution. We have finally found an animal eye clinic nearby that accepts rabbits, so we don’t have to drive all the way to Greensboro anymore. His check-ups are also down to twice a year now. Bunny is still happy and healthy overall! He can see well and the fact that he can’t focus anymore is only noticeable occasionally when he misjudges distances and jumps too far or bumps his head on things. This really is a rare thing, though! 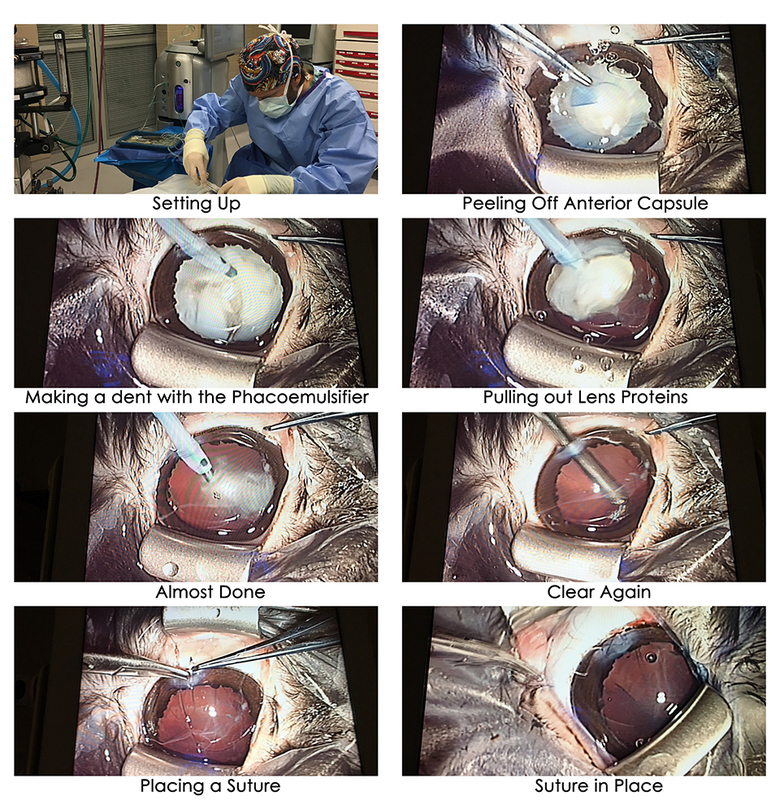 Dr. Walters knew that I wanted to write about our experience and provided some awesome pictures and even a video of the procedure. They are not terribly gruesome (there’s no blood and you can’t really tell that it’s Bunny on the operating table), so if you want to see them, keep scrolling. If not, now is a good time to stop. Bunny shortly after the surgery. He was still very sleepy.